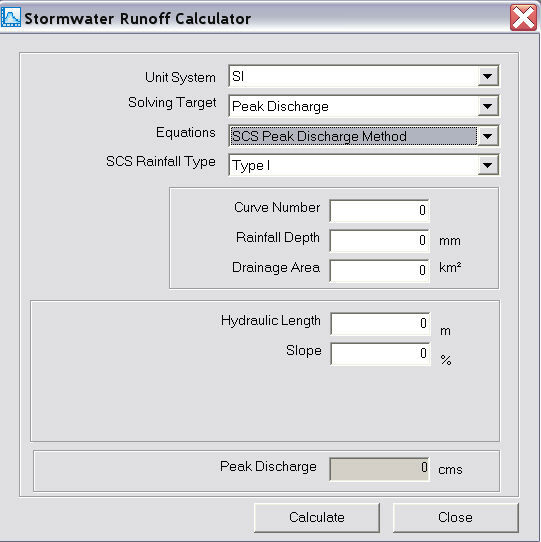 The dialog box for the SCS peak discharge method is shown below. Flow Calculator (Simple in Innovyze H2OCalc) – Option for SWMM6? The Flow Calculator category performs hydraulic calculations for the following elements: Circular Channel, Rectangular Channel, Triangular Channel, Trapezoidal Channel, Irregular Channel, and Pressurized Pipe.